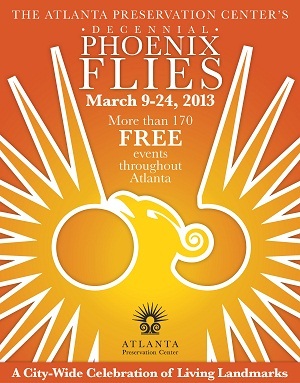 Atlanta Preservation Center :: Welcome to the Deccennial Phoenix Flies! Welcome to the Deccennial Phoenix Flies! No city stands still. There is no choice of moving backward or forward — it must be forward — but how we do that makes a difference. For the 10th anniversary of Phoenix Flies, the Atlanta Preservation Center is looking at many, many ways of moving forward with all of our Preservation Partners. Each presentation you will experience is an act of creativity wherein an individual or group of people is trying to make a better world through their actions and reflections. We reflect on those who have helped us move forward and were lost to us last year: Margaret Perdue, who created the name for this celebration, The Phoenix Flies, and Bamby Ray, one of the great activators of a rich built environment in Atlanta. Among Bamby’s many gifts to the City were her efforts with the Fulton Bag and Cotton Mill’s development, the Glenn Hotel project, and the designation of Sunset Avenue neighborhood as a Historic District. In future years we will all be enjoying and building on what these ladies accomplished. We will use their indomitable examples as beacons for our efforts. As you enjoy the Decennial Phoenix Flies: A Citywide Celebration of Living Landmarks, we invite you to move forward with us in working to bring the best of the past into a bright future for our City. This is the purpose of preservation.